This is his second stint as a Union Minister, after heading the Rural Development Ministry in the year 2000. An astute leader, inspiring orator and a committed party worker, M Venkaiah Naidu became the BJP president in 2002 and is among the party’s prominent faces from southern India. Hailing from a a remote village named Chavatapalem in Nellore district of Andhra Pradesh, the 65-year-old leader is a Rajya Sabha member from neighbouring Karnataka. After graduating from V R College, Nellore, he obtained law degree from Andhra University at Visakhapatnam. He was also the president of Students Union, Andhra University Colleges in 1973. Commencing his political journey as president of the youth wing of Janata Party in Andhra Pradesh, he has held a number of positions in BJP. He was elected twice to the Legislative Assembly in Andhra Pradesh and to the Rajya Sabha three times. An experienced Parliamentarian, Naidu was a member of various Standing Committees including External Affairs and Finance. Presently, he is the Vice-President of the Parliamentary Forum on Disaster Management. 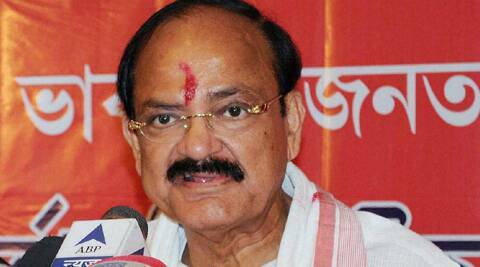 Naidu was a Union Minister of Rural Development between eptember 30, 2000 and June 30, 2002 in Atal Bihari Vajpayee government. Later he functioned as the national President of BJP from July 2002 to October 2004.